Jigsaw PSHE has recently been part of a project with EACH – Educational Action Challenging Homophobia. Jonathan, the executive director, writes here about how successful the partnership has been. The project has produced new lesson plans challenging homophobia, biphobic and transphobic bullying. We hope you might have a look at the resources and see how closely EACH and Jigsaw’s values align. 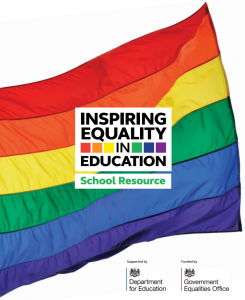 “EACH was pleased to work in partnership with Jigsaw PSHE, creating the lesson plans for our award-winning school resource, Inspiring Equality in Education. Having explored the PSHE resources available to primary schools, Jigsaw was the obvious choice to adapt for inclusion. EACH was delighted when Jan Lever agreed so readily to see her work included in our Resource. EACH’s adaptations of Jigsaw remain true to its source material: enhancing the lesson ideas to allow primary teachers to even more fully explore topical issues like the similarities and differences between us all that make us unique. Inspiring Equality in Education lesson plans also focus on concepts such as ‘different families’ – exploring the evolution of modern families, how everybody’s family is unique and to be respected. Other lesson ideas look at toys, how they’re often targeted at boys or girls and how helpful this is. A lesson for upper Key Stage 2 allows teachers to appropriately introduce their pupils to the hugely important historic contribution gay or trans people have made to our society – for instance, Alan Turing.